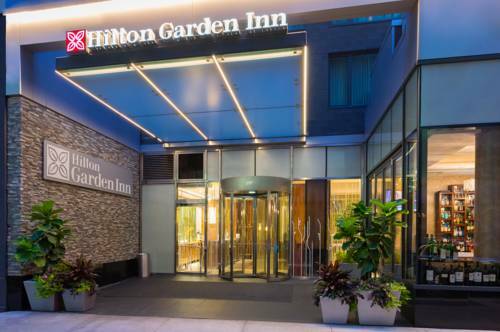 The stylish Hilton Garden Inn New York/Central Park South-Midtown West hotel boasts a central location in the heart of Midtown Manhattan offering easy access to a wealth of shopping opportunities restaurants bars and entertainment. Our friendly and modern hotel boasts close proximity to world-famous NYC attractions including Central Park Times Square and the Empire State Building. Shop in designer stores on Fifth Avenue and discover eateries bars and shopping at Columbus Circle. Take in a musical or Broadway show or hire a bicycle and explore leafy Central Park. Soak up the quaint European-style ambience of the West Village home to vibrant sidewalk cafes boutiques and specialty food stores or marvel at contemporary paintings and sculptures in the Museum of Modern Art. Unwind in a spacious and stylish guest room and enjoy a fantastic range of amenities including complimentary internet access a 40-inch LED TV a microwave and a mini-refrigerator. Inviting suites are also available at this Midtown Manhattan hotel offering additional space and amenities - ideal for families or longer stays. Enjoy tender steaks and juicy burgers in the relaxed atmosphere of Empire Steakhouse which features a stylish open sidewalk bar or enjoy breakfast lunch and dinner in your guest room with Room Service. Buy snacks and travel essentials from the 24-hour Pavilion Pantry-reg. and maintain your exercise regime in the complimentary 24-hour fitness center. Fax documents and check emails in the complimentary 24-hour business center and hold an event or celebration with two flexible meeting spaces and contemporary A/V technology. Reservations must be cancelled 24 hours prior to local time of arrival to avoid penalty. Policy is subject to change. The Carnegie Deli is a NYC landmark. Our famous sandwiches and cheesecakes are the best in NYC and the world. Made even more famous in the movie *When Harry Met Sally*. Da Marino serves traditional authentic Italian cuisine featuring Chef Masimo* Northern Italian dishes and Chef Pasquale* Southern Italian cooking.